Get ready to speak out for our ocean, waves, and beaches. Federal leaders are plotting to bring oil rigs to a coastline near you. Here we go again. Just months after the Obama Administration finalized a 5 year offshore drilling plan that protects the Atlantic, Pacific, Eastern Gulf of Mexico, and Arctic from oil rigs through 2022, members of congress are proposing new oil and gas development off U.S. coasts. The proposed legislation is likely just a prelude to a Trump Administration announcement that it will begin planning for expanded offshore drilling in U.S. waters. Senator Bill Cassidy (LA) has introduced S. 665 with three other senators to authorize additional offshore drilling within a finalized 5 year leasing program. The bill would streamline the approval of lease sales in the Gulf of Mexico while putting states such as Virginia, North Carolina, South Carolina, Florida, California, and Alaska at risk of new offshore drilling in the next few years. Meanwhile, Rep. Dave Brat (VA) has circulated draft legislation that would remove permanent protections in the Arctic and parts of the Atlantic from offshore drilling. These brazen proposals fly in the face of the Bureau of Ocean Energy Management’s (BOEM) recently completed environmental assessment of offshore drilling that informed the 2017-2022 Oil & Gas Leasing Program. Moreover, the legislation puts the interests of the oil and gas lobby over millions of citizens, thousands of businesses and hundreds of coastal communities who spoke out against new offshore drilling during the federal government’s extensive planning process. Expanding offshore drilling to new regions would damage our nation’s precious marine ecosystems, as well as industries such as tourism, fishing, and recreation. Our coastal economies are fundamentally dependent on a healthy marine environment, and the impacts and risks of oil and gas development are simply not worth the limited benefits. According to the National Ocean Economics Program, the ocean tourism and recreation industry directly provides twelve times the amount of jobs nationwide than offshore oil drilling. New offshore drilling would also reinforce our dependence on fossil fuels and increase carbon pollution. If we are serious about stopping climate change, which threatens the planet as we know it – including coastlines through sea level rise and increasing storm activity - the last thing that Congress and the Administration should do is support more oil and gas development off our coasts. Fortunately, there are leaders in Congress who understand the need to protect our coasts from the impacts and risks of oil drilling. Sen. Dianne Feinstein (CA) and Rep. Jared Huffman (CA) have introduced the West Coast Protection Act (S. 31) that would protect California, Oregon, and Washington from offshore oil and gas development. Meanwhile, Rep. Frank LoBiondo (NJ) has sponsored H.R. 728 to protect the New Jersey coast from new offshore oil and gas lease sales. While these bills face long odds of passing, it’s critical that we demonstrate grassroots support for them and oppose legislation such as S. 665 that would promote new offshore drilling of our coasts. Building bipartisan opposition to new offshore drilling is essential if we are to thwart the Trump Administration’s plans to open our coasts to new oil and gas development. Join the Movement to Stop New Offshore Drilling! For decades, Surfrider chapters have defended our nation’s coastlines from new oil drilling. Now, as Congress and the Trump Administration take aim at our coasts, our network is ready and motivated for the next battle. In the coming months we will rally opposition at the grassroots level to compel our federal leaders to cancel plans for new offshore oil and gas development. Our chapters will continue public outreach and passage of local government resolutions against offshore drilling and seismic testing. We will participate in the People’s Climate March and hold Hands Across the Sand events from coast to coast. 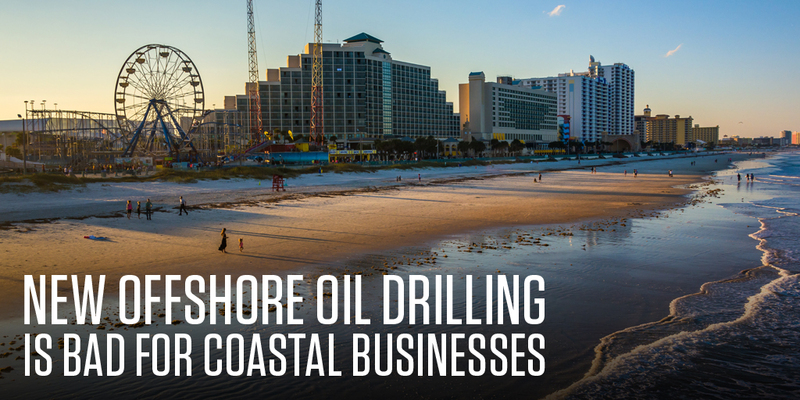 We will grow our coalition of recreational businesses and groups engaged in stopping new offshore drilling. Finally, we will target federal leaders through phone calls, emails, and lobby visits as part of the Blue Vision Summit in Washington D.C.
Now is an excellent time to join our campaign to stop new offshore drilling off U.S. coastlines. Please see the links below to learn how you can take action. Call your federal representatives to tell them to oppose new offshore drilling! Find your member's phone numbers here: Senate and House.